The Anti-Corruption Trust of Southern Africa (ACT-SA) welcomes the appointment of a substantive Prosecutor General for Zimbabwe but urges him to expedite the prosecution of high profile corruption cases in the hands of the National Prosecuting Authority (NPA). On the 23rd of January 2019, President Mnangagwa swore-in Mr. Kumbirai Hodzi as the country's substantive Prosecutor-General who has been on acting capacity since 24 July 2018. However, ACT-SA has noted with concern that there is a deliberate failure and/or neglect to prosecute high profile corruption cases which gives a wrong impression that there are some individuals who are above the law. Similar to what ACT-SA is doing in other SADC Member States, it will continue to monitor and report on progress vis-à-vis the finalization of these high profile corruption cases. Zimbabwean authorities are well-known for protecting corrupt high profile individuals. In the 1980s, Zimbabweans witnessed the Paweni scandal (1983), The GMB scandal (1985), Kumbirai Kangai NOCZIM scandal in which 142 million had been embezzled (1986), Zisco Steel blast Furnace Scandal (1987), Air Zimbabwe Fokker Plane Scandal $100 million (1987), National Railways Housing Scandal (1986), Willowgate Scandal (1988), and the ZRP Santana Scandal (1989) to name but a few. Apart from these scandals being talked about, there were no arrests and convictions. As if that was not enough, in the 1990s, several scandals shocked the nation. 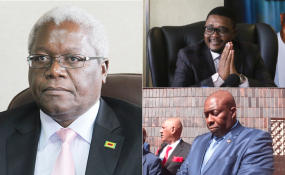 These included the War Victims Compensation scandal (1994), GMB grain scandal (1995), VIP Housing Scandal (1996), Boka Banking Scandal (1998), ZESA YTL Soltran Scandal (1998), Telecel Scandal (1998), Harare City Council Refuse Tender Scandal (1998), Housing Loan Scandal (1999), Noczim Scandal (1999), GMB Scandal (1999), Ministry of Water and Rural Development Chinese tender scandal (1999), VIP Land Grab Scandal (1999), and the Harare Airport Scandal (2001) among others. After the swearing-in of President Mnangagwa, a number of high profile individuals were arrested such as Ignatius Chombo, Jason Machaya, Walter Mzembi, Francis Gudyanga, Walter Chidhakwa, Savour Kasukuwere, David Parirenyatwa, and Supa Mandiwanzira among others. However, there has been little progress on the reported cases.